Happy Sunday guys!!!! I hope you all are taking this NO HEAT CHALLENGE in stride lol. It can be difficult for those of you who have never gone without heat (on purpose) for a long period of time, but I believe in you! You can do it! If you haven't purchased your copy of my e-book "How to grow longer healthier hair" you can do so here. 1. Absolutely NO direct heat! 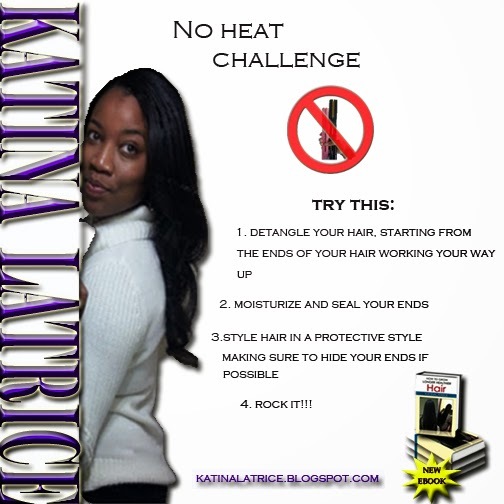 Remember ladies, that this challenge is promoting healthy hair growth. Allowing your hair to rest from heat allows it to grow and retain length. Less heat = more growth and less breakage and thinning. The rules are simple. NO HEAT or LIMITED HEAT(i.e. once a month). Practice things like roller setting, bantu knots, braid outs, etc...anything that prevents heat. Ready, Set, GO!!!! If you have any questions, post them below in the comment section.